Sometimes, you can’t help but notice that certain buildings practically glow with the cheerful optimism and civic spirit with which they were constructed. North York Centre is one of those places. Look at that space-age platform ceiling! Zing! Those blue aluminium ceiling slats radiate with energy. The key to the effect: no missing slats. When the Yonge subway was extended to Finch in 1974, North York Centre was forsaken as an intermediary stop due to budgetary constraints. But over the next few years, impelled by the burgeoning growth of North York, the notion of a station to service the area’s ‘downtown’ gained fresh currency, with a particularly dogged champion in the form of North York Mayor Mel Lastman. A ‘Park Home’ station, he argued, would spark the biggest building boom ever witnessed by the borough. In 1982 Lastman successfully petitioned the TTC to approve the $20 million facility. Five years after that, on July 18, 1987 he personally attended the ribbon-cutting ceremony for the station’s official opening. As an addition (but not an extension) to the North Yonge line, North York Centre was the first station on the network to be constructed around existing subway tracks. The load-bearing concrete walls between the tracks attest to this unique aspect of its construction; only small gaps exist with which to peer across to the opposing platform. The result is that standing on the platform, you feel like you’re in a rectangular version of the tubes found at St. Patrick and Queen’s Park. On view at North York Centre are two large glazed ceramic mosaics by Susana and Nicholas Graven. They depict heritage views of the local area. The murals were commissioned by the city, and implemented in 1988. With over 5,000 tiles, they took over a year to create. Upstairs in the mezzanine, a small dedicatory plaque makes note of “the unionized construction workers whose skills built this transit system”. Your personal escalator to the concourse. 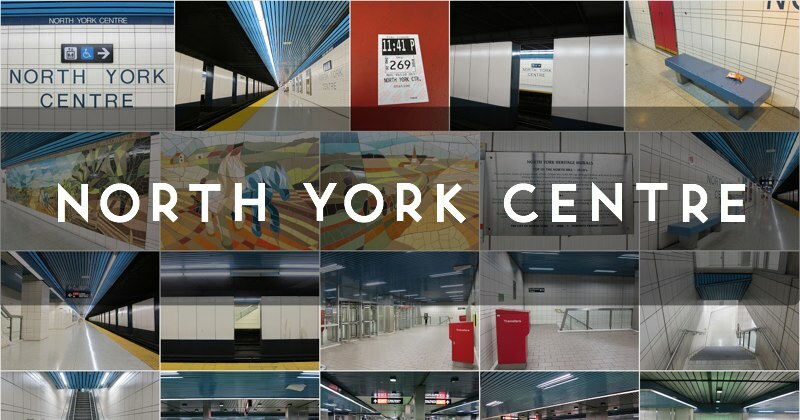 Despite its connections to the North York Civic Centre, the North York Public Library, Mel Lastman Square, and the Empress Walk shopping complex, North York Centre station has never quite lived up to the promise and hope that fuelled its design. In terms of passenger volumes, the station is stuck firmly around the middle of the rankings. Aside from the morning rush, it is rarely truly busy. During the evenings, it can resemble a ghost town. Unfulfilled potential lies behind these walls. 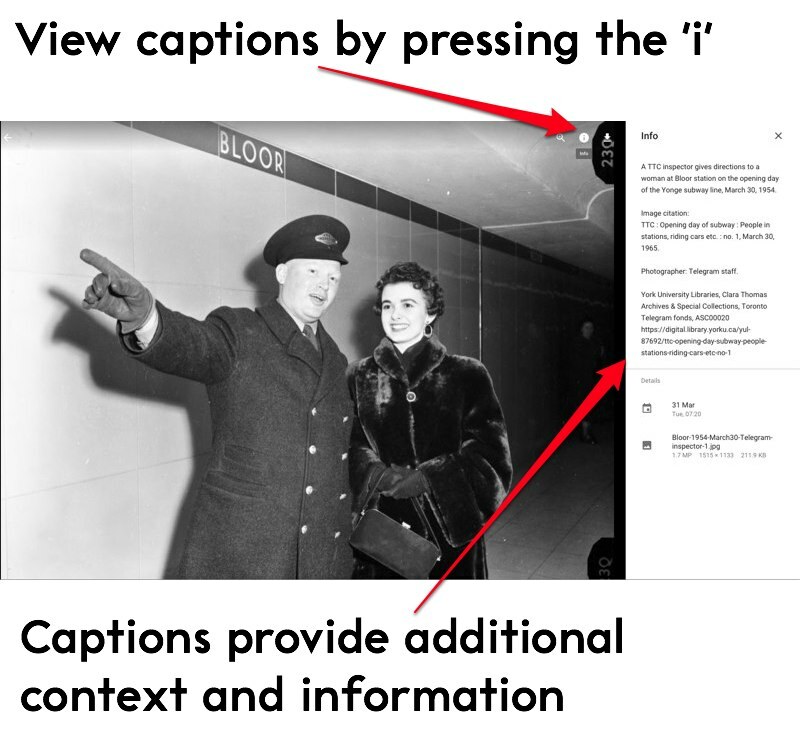 Have you ever wondered why the north end of the mezzanine has that narrowed passageway? Those dusty ‘temporary’ walls hide reserved space for 20 shops: commercial demand for those spaces has never come to pass. It has been like that for close to 30 years, as far as I can tell. I won’t suggest that North York Centre is a failure, but rather a sincere underachiever. It is an orderly, clean station, and who isn’t gladdened by that forceful blue colour scheme? I heartily applaud the focused municipal ambition which brought the station into existence; it took nearly a decade before we mustered the resolve to build the next one.